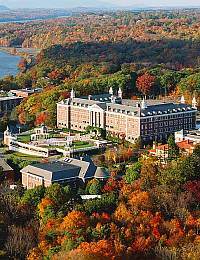 Hello from The Culinary Institute of America’s Sustainability Committee! 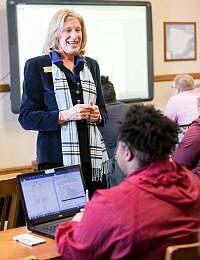 Our mission is to educate students and faculty about the advancement and implementation of the CIA’s environmental awareness, planning, and educational programs. One advancement, which has recently become a big topic of discussion on campus, is the modernization and improvement of our current waste management program. We have decided to put a new waste bin system in place in all of our kitchen classes to collectively—as a community—reduce the amount of waste we have on campus. Currently, the bins in the kitchen classes include a yellow one for recycling, blue for composting, and gray for landfill. 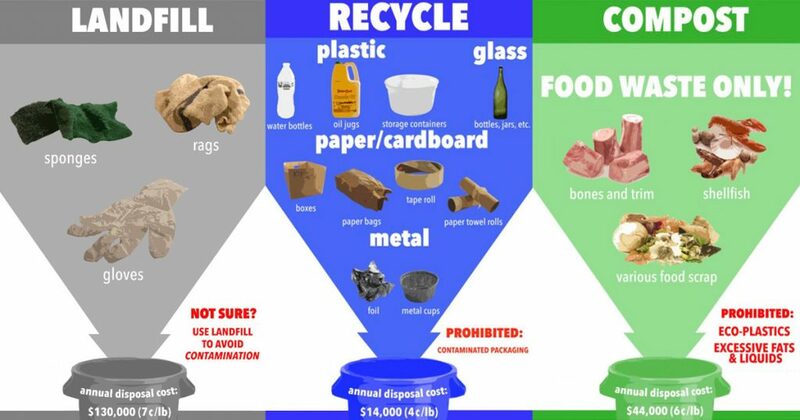 This is not a bad system when everyone following it is aware of what can be recycled, composted, and trashed; however, hardly anyone on campus knows all of our current waste company’s rules on what can be composted and recycled. To minimize the confusion and help the CIA campus reduce waste, Committee Chairman Dylan Leary and our Facilities Department have come up with a bin system where labels are attached to the color-coordinated bins that specify exactly what can be put in each one. 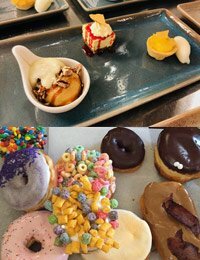 This way, the students and chefs will not have to question what goes where. Whatever is acceptable, according to our current waste company, will be diagrammed on the bins. The recycling bins will hold plastic items (water bottles, storage containers, rinsed-out and oil jugs), glass items (rinsed-out bottles and jars), clean paper and cardboard products, and clean metal items (foil, as well as metal cups). It’s important to note that when I listed examples of these items, I used the words “rinsed-out” and “clean.” If the recyclable items are dirty, they are considered contaminated and will not be accepted by the recycling plant. 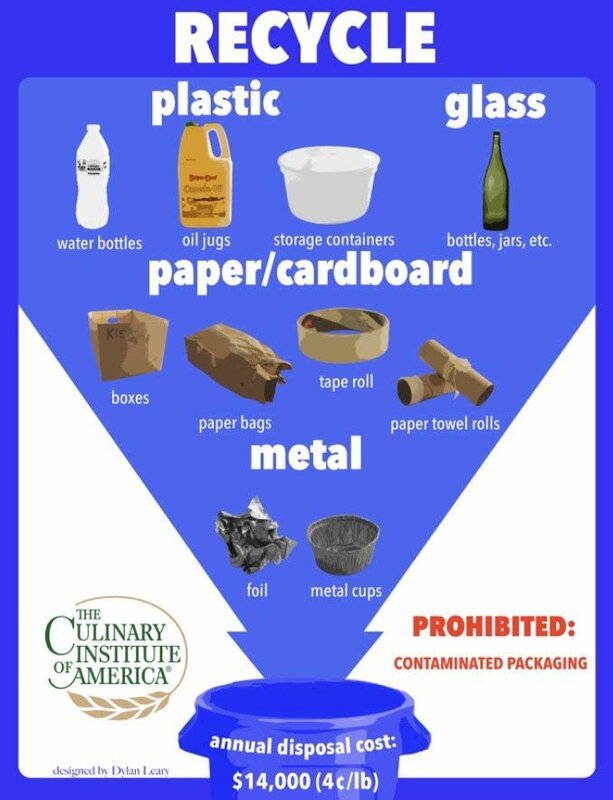 Only reasonably clean plastic, paper, metal, and glass objects can be put into the blue bin. It is encouraged that chef-instructors make rinsing out dirty recyclable material a part of the cleaning process in class. Lastly, the compost bins must contain ONLY food. This has been the CIA’s largest problem with our waste management system. Unfortunately, contamination in our compost leads to some of it being redirected into landfills. 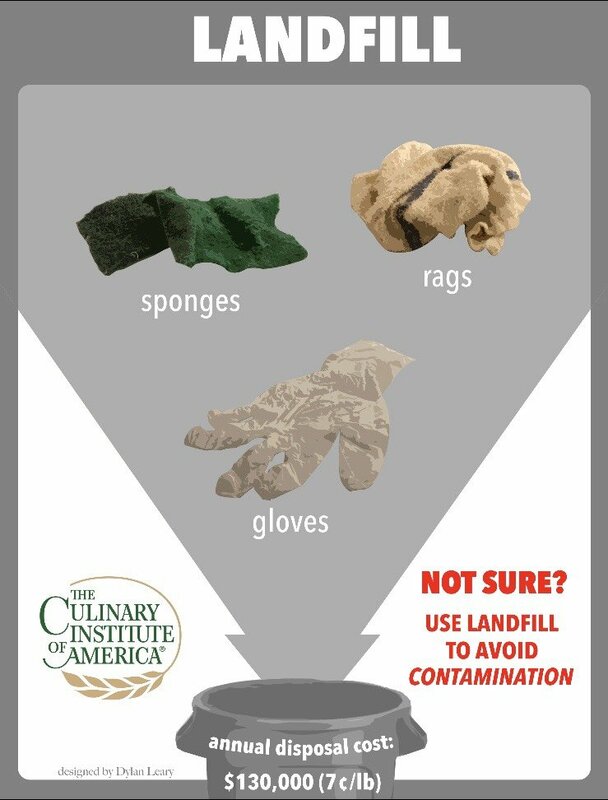 To avoid wasting perfectly fine composting materials, follow our composting site’s stricter rules, and reduce confusion about what can be composted and what can’t, the CIA will now compost only food. 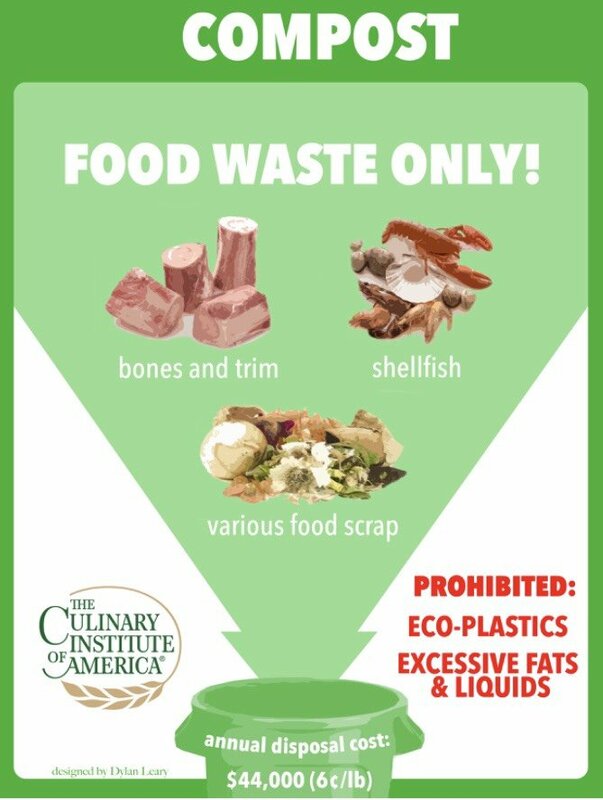 If something is not a food item, it should not be composted. The CIA Sustainability Committee and faculty wishes to make this new program a success and ask for the students’ help in making this new system work! Every piece of waste, no matter how small it is, will make an impact. 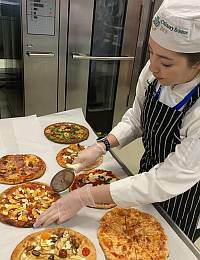 Students and faculty alike are not just asked to practice good waste management in the kitchen classes, though; they’re also asked to do the same everywhere else on campus as well. If anyone has comments or ideas on how to implement more sustainable waste practices on campus, please reach out to our committee on our Instagram: sustainabilitysga. We want to make CIA a better place to learn, bake, and cook, but we cannot do it without everyone’s effort!